This apartment building located in Toronto, Canada had a reciprocating water-chiller original to the building – 1968! We conducted an energy audit to determine its performance and confirm the actual capacity of 80 tons. In addition to saving electricity and securing incentives from the local electric utility, Toronto Hydro, this article will focus on how this unique chiller retrofit saved natural gas and secured incentives from the local gas company- Enbridge! Most chiller retrofits are intended to improve efficiency and save electricity. How can this chiller installation save natural gas as well? 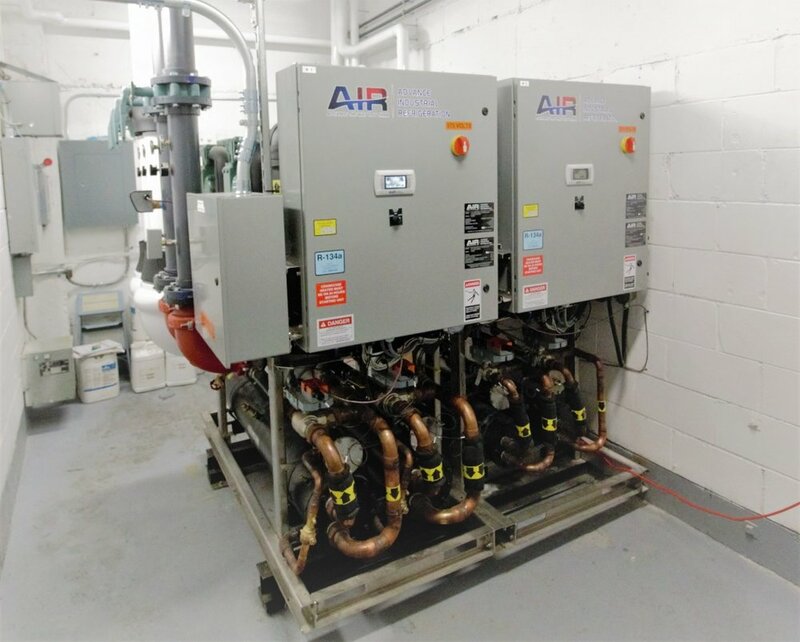 While most chillers reject their condenser heat outdoors through a cooling tower, this chiller diverts waste heat and uses it for domestic hot water instead. That means the chiller can cool the building during summer months and deliver free hot water at the same time! As part of the energy audit, we measured the domestic hot water flow rate and temperatures. This gave an accurate depiction of the actual hot water use in the building. In most high-rise residential buildings, the chiller can develop more than enough heat for the domestic hot water load. In this case, it was determined that 2 ModulAIR chiller modules should be installed: one 25 ton heat recovery module and one 55 ton standard module. This meets the total required cooling capacity of 80 tons while the heat recovery module delivers 240,000 btu/hr of heat at 160 F.
Looking closer at the two modules, you can see the far chiller (25 ton) has an additional heat exchanger (condenser) and circulator pump. The chiller is piped to the boiler loop just like any other boiler. When there is a call for heat, the pump kicks on and moves boiler water through this secondary condenser. The cooling tower water that circulates through the primary condenser is cut off and the chiller begins rejecting heat to the boiler loop. The new ModulAIR chiller records and sends data so anyone can view it remotely. Below is a graph showing the heat recovery operation for a given day. As you can see, the chiller cycles in and out of heat recovery mode to maintain the domestic hot water temperature at night. During the day, the chiller spends most of its time in full heat recovery mode. The chiller at this apartment building runs from June through mid September. During this 14 week time, the heat recovery module had an average demand of 82% and saved over $5,400 in natural gas! Enbridge offered an additional $1,500 incentive. The incremental cost of the heat recovery feature was more than paid for in the first summer of operation. 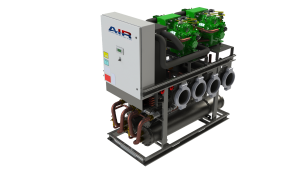 For more information about this system, visit the ModulAIR page or Contact AIR. We can conduct the audit to determine feasibility, help with the piping layout and confirm energy savings with actual data! ENERGY MONITORING CONFIRMS- YOU NEED TO HAVE SHELL & TUBE CONDENSERS ON YOUR NEXT CHILLER. Considering a new chiller plant or chiller retrofit? Many modular water-chillers are focused on the lowest possible capital cost. This means cutting corners on parts that are critical to life span, maintenance, and long term energy efficiency of the chiller plant. In this example, an old modular chiller was replaced with a new ModulAIR chiller. This article focuses on long term energy efficiency using actual data to understand how the old chiller managed to consumed 300% more energy than the chiller that replaced it! Figure 1: Comparison of energy consumption of old chiller vs. newly installed ModulAIR chiller. As you can see from Figure 1; the energy consumption of the existing chiller had become extremely poor, more than twice its original published kw / ton value. This graph is based on actual data recorded on site. Both chillers are operating at the same flow rates and temperatures for an equivalent comparison. The Figure also shows that the old chiller operates in distinct power consumption “steps” due to the on / off control nature of its scroll compressors. Inside of a Brazed Plate condenser, passages are 1/8″ wide. The existing chiller featured brazed plate condensers. Over time, debris from the condenser (cooling tower) system builds up in the small passages of the condenser. Despite multiple attempts to clean the condensers with specialized equipment and chemicals, the efficiency of the chiller continued to deteriorate. There is simply no proper way to clean the inside of a brazed plate condenser! To get this photo of the inside of a brazed plate condenser, we literally had to cut it open. Yes, this chiller had water-strainers too! 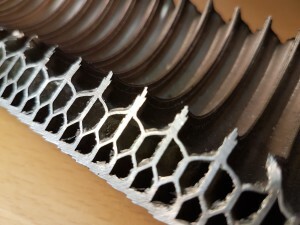 Image of a Shell & Tube condenser, passages are 3/4″ wide. Shell & tube condensers on the other hand, can be opened and cleaned on a regular basis. This helps maintain heat exchanger performance and prevent situations as shown in Figure 1. To learn more about different types of heat exchangers, see our other blog post. The end-caps of the condenser can be removed and conventional cleaning equipment can be used to clean the tubes. All ModulAIR chillers feature shell & tube condensers as a standard offering. There is no need to add strainers which can become plugged up causing low flow issues and other maintenance headaches. As discussed, the new chiller has significant improvements in terms of energy efficiency. This is party due to advancements in compressor technology and party due to having cleanable condensers that will not foul over time. Using measured data, the new chiller saves $22,000 in electricity every summer for this customer and was given incentives from the local government. New ModulAIR chiller installation shown. To learn more about the energy efficiency characteristics of the ModulAIR chiller manufactured by Advance Industrial Refrigeration, click here.